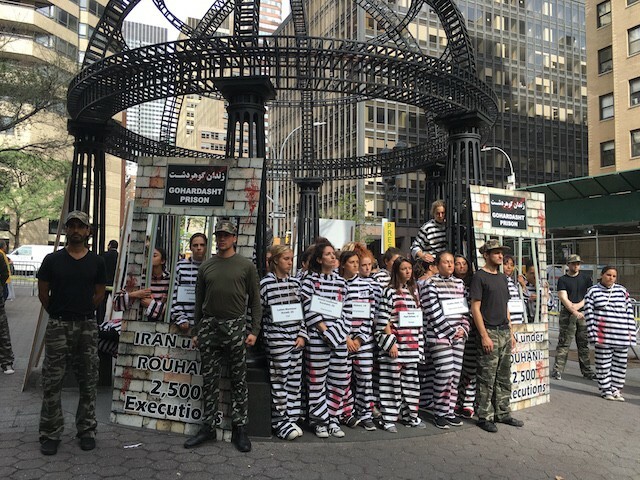 NEW YORK – Thousands of members of the Iranian resistance group the Mujahedin-e-Khalq (MEK), or the People’s Mujahedin Organization of Iran (PMOI), held a rally and put on mock executions at the United Nation’s Dag Hammarskjold Plaza in New York City on Tuesday to protest President Hassan Rouhani’s visit to the U.N. and to shed light on his role in the 1988 massacre of 30,000 political prisoners who were hung, shot and buried in mass graves. 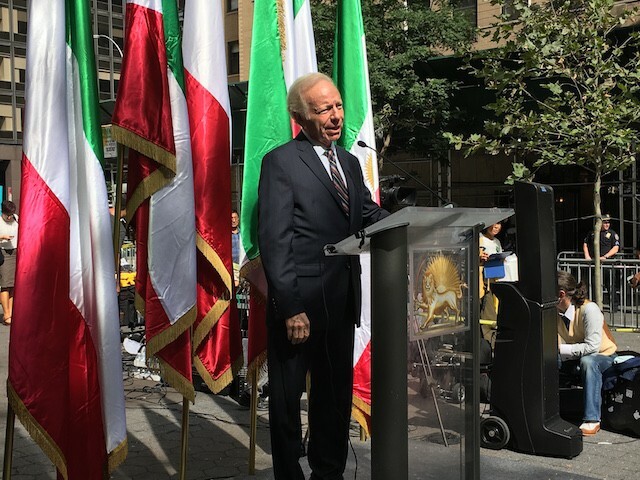 Speakers at the event included former Democratic vice presidential candidate and Connecticut Sen. Joe Lieberman, Sir Geoffrey Robertson, the President of the U.N. Special Court for Sierra Leone, and former Iranian political prisoner Pastor Saeed Abedini. 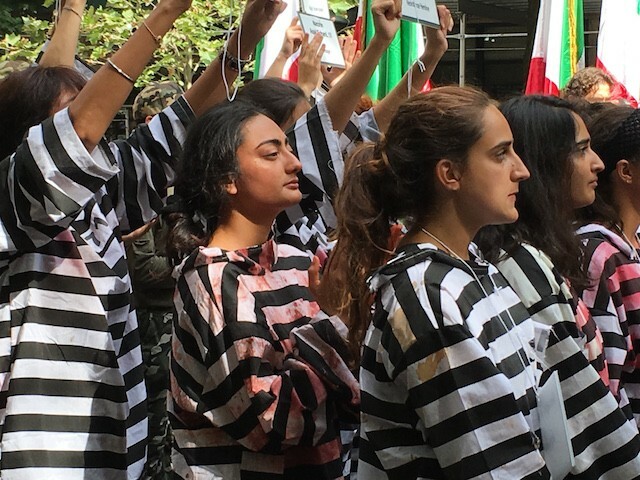 A reenactment of the mass executions of 30,000 political prisoners was orchestrated by the PMOI. 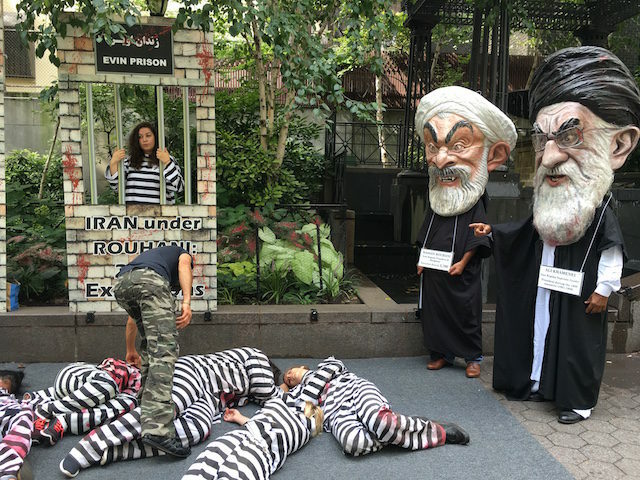 Female actors, dressed in prison uniforms, were escorted to their deaths by IRGC guards as two larger-than-life-sized Papier Mâché figures of Iran’s Supreme Leader Ayatollah Ali Khamenei and President Rouhani supervised the act. 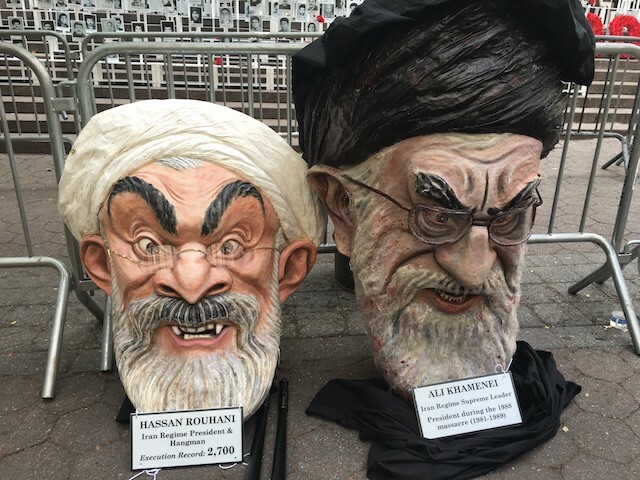 Khamenei was president at the time of these mass killings and Rouhani was the Deputy Commander-in-chief of the Iranian regime’s armed forces, and had served as a member of the regime’s Supreme Defense Council since 1982. 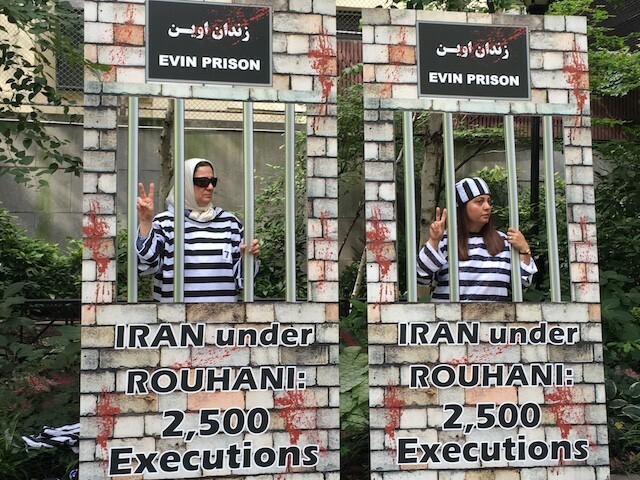 At least 50 officials who were involved in the 1988 executions are currently active and serving in the Iranian Regime. Some of the political prisoners were hung, four at a time, others shot by firing squad. All of the prisoners were buried in mass graves. 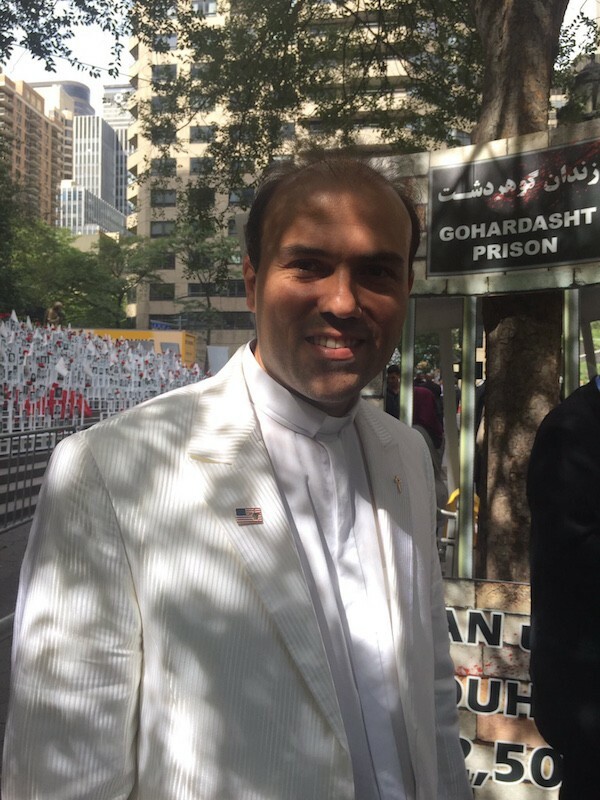 Most of them were members of the Iranian resistance. 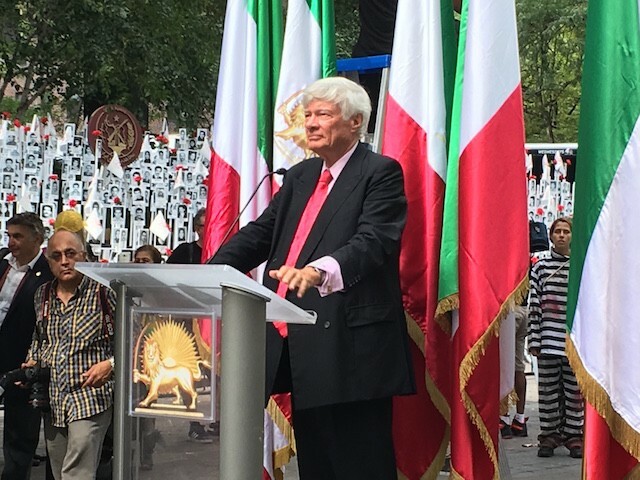 The President-elect of the National Council of Resistance of Iran (NCRI), Maryam Rajavi, was not present for the rally but sent a written statement to all who participated in protesting Rouhani’s visit to the United States. Rouhani addressed the U.N. on Thursday. Sir Robertson also addressed the plight of British-Iranian dual citizen Nazanin Zaghari Ratcliffe, 37, who was arrested along with her infant daughter, Gabriella, during her most recent visit to Iran on April 3. 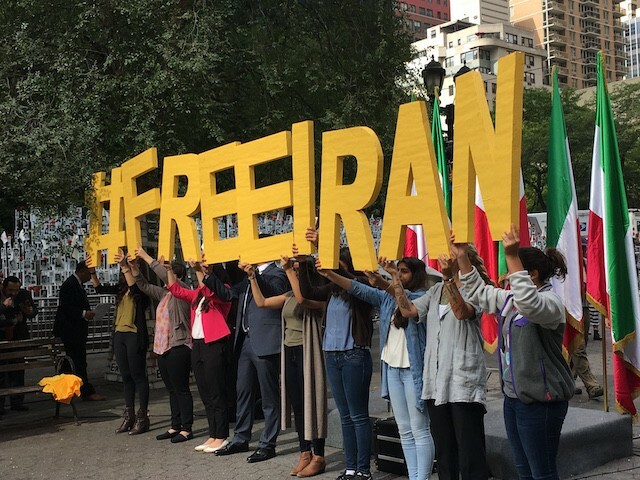 Robertson blasted the British government for doing little to rescue their national from Iran’s prison, suggesting their silence was a result of preventing any interruption in business between the Islamic Republic and the United Kingdom. British Airways recently began doing business with Iran again. “And why doesn’t Britain protest?” Robertson posited. “This is the problem: That Britain’s cowardly and pathetic government will not sand up to the mullahs, will not [utter] a squeak of protest: No demanding that her husband should be allowed to visit her. No demanding the British Consul should be allowed to visit. Iran is in breach of international law by refusing to allow them,” he said.